Basement flooding is unfortunately a common occurrence, often with devastating effects. The number one reason for basement flooding is the failure of a sump pump system to effectively function. Unless properly designed, a typical home's sump pump system failing is not a matter of if but rather of when. Perhaps, the most essential basement waterproofing product is the primary sump pump. Emecole offers the EmeSump, a high performance primary sump pump, available in three separate models (1/3 HP, 1/2 HP and 3/4 HP). 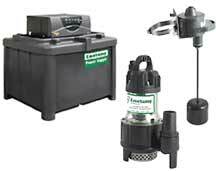 In addition, we offer a full line of battery backup sump pumps and accessories. Our sump pump lines are efficient, reliable and easy to install, making them a great addition to any basement waterproofing business. Relying on a primary sump pump alone is not a recommended measure when thinking about basement waterproofing. Basements are at a significantly higher risk when the primary sump pump fails, either because of a mechanical error or from a power outage. Battery backup sump pumps are absolutely necessary in order to fully waterproof a basement, while maximizing a contractor's line of basement waterproofing products. Emecole provides a complete line of battery-operated backup sump pumps systems to help turn your customers' wet basements into dry, clean, livable areas. Emecole's basement waterproofing product line includes several backup sump pump models. The EmeSump 1400 backup systemis fully automatic, converting 12V DC battery power into standard 115V AC electricty. Consumes half the power of other pumps for an extented run time during power outages. Performs at full performance until batteries are dead. 1/2 HP, 1400 watt charger/inverter. The EmeSump 2100-DC backup system pumps 2100 gallons per hour at 10 ft. of discharge for a total run time of eight hours from one AGM Battery. The 12V DC EmeSump pump and adjustable switch are far more reliable, while pumping more water than the leading brands. Includes a powerful 8 amp charger for quick recovery time. The SumPro is one of the most reliable backup power systems for basement waterproofing flood protection. An automatic-auxiliary converter, the SumPro supplies up to 1800 watts of electricity. The Sumpro allows a sump pump or other household appliance to plug into it, while the SumPro plugs into a standard wall outlet, charging while there is power. Once power goes out, the Sumpro converts its stored D.C. battery power into 115 volt AC power, providing critical backup power to those appliances plugged into the system. This allows a homeowner to use a 115 volt AC sump pump without worry and without the need of a D.C. powered backup pump.